After the middle of the nineteenth century, this world of new powers and old ideas, this fermenting new wine in the old bottles of diplomacy, broke out through the flimsy restraints of the Treaty of Vienna into a series of wars. By an ironical accident the new system of disturbances was preceded by a peace festival in London, the Great Exhibition of 1851. The moving spirit I in this exhibition was Prince Albert of Saxe-Coburg-Gotha, the nephew of Leopold I, the German king who had been placed upon the Belgian throne in 1831, and who was also the maternal uncle of the young Queen Victoria of England. She had become queen in 1837 at the age of eighteen. The two young cousins—they were of the same age—had married in 1840 under their uncle’s auspices, and Prince Albert was known to the British as the «Prince Consort». He was a young man of sound intelligence and exceptional education, and he seems to have been greatly shocked by the mental stagnation into which England had sunken. Oxford and Cambridge, those once starry centres, were still recovering but slowly from the intellectual ebb of the later eighteenth century. At neither university did the annual matriculations, number more than four hundred. The examinations were for the most part mere viva voce ceremonies. Except for two colleges in London (the University of London) and one in Durham, this was all the education on a university footing that England had to offer. It was very largely the initiative of this scandalized young German who had married the British queen which produced the university commission of 1850, and it was with a view to waking up England further that be promoted the first International Exhibition which was to afford some opportunity for a comparison of the artistic and industrial products of the various European nations. The project was bitterly opposed. In the House of Commons it was prophesied that England would be overrun by foreign rogues and revolutionaries who would corrupt the morals of the people and destroy all faith and ‘loyalty in the country. The exhibition was held in Hyde Park in a great building of glass and iron—which afterwards was re-erected as the Crystal Palace. Financially it was a great success. It made many English people realize for the first time that theirs was not the only industrial country in the world, and that commercial prosperity was not a divinely appointed British monopoly. There was the clearest evidence of a Europe recovering steadily from the devastation of the Napoleonic wars, and rapidly overtaking the British lead in trade and manufacture. It was followed directly by the organization of a Science and Art Department (1853), to recover, if possible, the educational leeway that Britain had lost. The exhibition released a considerable amount of international talk and sentiment. It had already found expression in the work of such young poets as Tennyson, who had glanced down the vista of the future. «Till the war-drums throb’d no longer, and the battle-flags were furl’d. In the Parliament of man, the Federation of the world». There was much shallow optimism on the part of comfortable people just then. Peace seemed to be more secure than it had been for a long time. The social gales of 1848 had blown, and, it seemed, blown themselves out. Nowhere had the revolution succeeded. In France it had been betrayed a second time by a Bonaparte, a nephew of the first Napoleon, but a much more supple man. He had posed as a revolutionary while availing himself of the glamour of his name; he had twice attempted raids on France during the Orleans monarchy. He had written a manual of artillery to link himself to his uncle’s prestige, and he had also published an account of what he alleged to be Napoleonic views, Des Idges Napolgoniennes in which he jumbled up socialism, socialistic reform, and pacificism with the Napoleonic legend. The republic of 1848 was soon in difficulties with crude labour experiments, and in October he was able to re-enter the country and stand for election as President. He took an oath as President to be faithful to the democratic republic, and to regard as enemies all who attempted, to change the form of government. In two years’ time (December, 1852) he was Emperor of the French. At first he was regarded with considerable suspicion by Queen Victoria, or rather by Baron Stockmar, the friend and, servant of King Leopold of Belgium, and the keeper of the international conscience, of the British queen and her consort. All this group of Saxe-Coburg-Gotha people had a reasonable and generous enthusiasm for the unity and well-being of Germany—upon liberal lines—and they were disposed to be alarmed at this Bonapartist revival. Lord Palmerston, the British foreign minister, was, on the other hand friendly with the usurper from the outset; he offended the queen by sending amiable dispatches to the French President without submitting them for her examination and, so giving her sufficient time to consult Stockmar upon them, and he was obliged to resign. But subsequently the British Court veered round to a more cordial attitude to the new adventurer. The opening years of his reign promised a liberal monarchy rather than a Napoleonic career; a government of «cheap bread, great public works, and holidays», and he expressed himself warmly in favour of the idea of nationalism, which was naturally a very acceptable idea to any liberal German intelligence. There had been a brief all-German parliament at Frankfort in 1848, which was overthrown in 1849 by the Prussian monarchy. Before 1848 all the great European courts of the Vienna settlement had been kept in a kind of alliance by the fear of a second and more universal democratic revolution. After the revolutionary failures of 1848 this fear was lifted, and they were free to resume the scheming and counter-scheming of the days before 1789-with the vastly more powerful armies and fleets the first Napoleonic phase had given them. The game of Great Powers was resumed with zest, after an interval of sixty years, and it continued until it produced the catastrophe of 1914. The Tsar of Russia, Nicholas I, was the first to move towards war. He resumed the traditional thrust of Peter the Great towards Constantinople. Nicholas invented the phrase of the «sick man of Europe» for the Sultan, and, finding an excuse in the misgovernment of the Christian population of the Turkish empire, he occupied the Danubian principalities in 1853. European diplomatists found themselves with a question of quite the eighteenth-century pattern. The designs of Russia were understood to clash with the designs of France in Syria, and to threaten the Mediterranean route to India of Great Britain, and the outcome was an all alliance of France and England to bolster up Turkey and a war, the Crimean War, which ended in the repulse of Russia. One might have thought that the restraint of Russia was rather the business of Austria and Germany, but the passion of the foreign offices ofFrance and England for burning their fingers in Russian affairs has always been very difficult to control. The next phase of interest in this revival of the Great Power drama was the exploitation by the Emperor Napoleon III and the king of the small kingdom of Sardinia in North Italy, of the inconveniences and miseries of the divided state of Italy, and particularly of the Austrian rule in the north. The King of Sardinia, Victor Emmanuel, made an old-time bargain for Napoleon’s help in return for the provinces of Nice and Savoy. The war between France and Sardinia on the one hand, and Austria on the other, broke out in 1850, and was over in a few weeks. The Austrians were badly beaten at Magenta and Solferino. Then, being threatened by Prussia on the Rhine, Napoleon made peace, leaving Sardinia the richer for Lombardy. The next move in the game of Victor Emmanuel, and of his chief minister Cavour, was an insurrectionary movement in Sicily led by the great Italian patriot Garibaldi. Sicily and Naples were liberated, and all Italy, except only Rome, (which remained loyal to the Pope) and Venetia, which was held by the Austrians, fell to the king of Sardinia. A general Italian parliament met at Turin in 1861, and Viet-or Emmanuel became the first king of Italy. But now the interest in this game of European diplomacy shifted to Germany. Already the common sense of the natural political map had asserted itself. In 1848 all Germany, including, of course, German Austria, was for a time united under the Frankfort parliament. But that sort of union was particularly offensive to all the German courts and foreign offices; they did not want a Germany united by the will of its people, they wanted Germany united by legal and diplomatic action as Italy was being united. In 1848, the German parliament had insisted that the largely German provinces of Schleswig-Holstein, which had been in the German Bund, must belong to Germany. It had ordered the Prussian army to occupy them, and the king of Prussia had refused to take his orders from the German parliament, and so had precipitated the downfall of that body. Now the King of Denmark, Christian IX, for no conceivable motive except the natural folly of kings, embarked upon a campaign of annoyance against the Germans in these two duchies. Prussian affairs were then very much in the hands of a minister of the seventeeth-century type, von Bismarck (count in 1865, prince in 1871), and he saw brilliant opportunities in this trouble. He became the champion of the German nationality in these duchies—it must be remembered that the King of Prussia had refused to undertake this role for democratic Germany in 1848—and he persuaded Austria to side with Prussia in a military intervention. Denmark had no chance against these Great Powers; she was easily beaten and obliged to relinquish the duchies. Then Bismarck picked a quarrel with Austria for the possession of these two small states. So he brought about a needless and fratricidal war of Germans for the greater glory of Prussia and the ascendancy of the Hohenzollern dynasty in Germany. 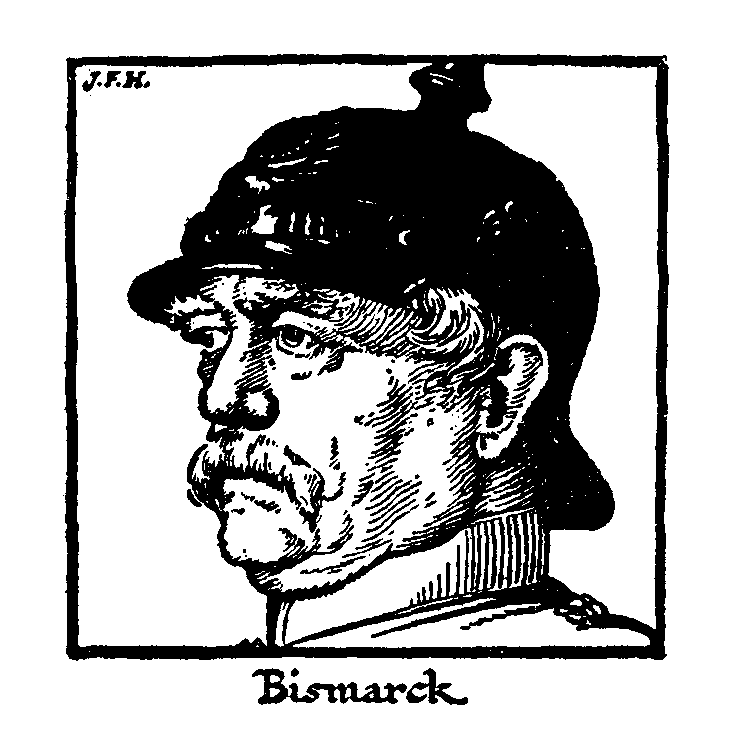 German writers of a romantic turn of mind represent Bismarck as a great statesman planning the unity of Germany; but indeed he was doing nothing of the kind. The unity of Germany was a reality in 1848. It was and is in the nature of things. The Prussian monarchy was simply delaying the inevitable in order to seem to achieve it in Prussian fashion. That is why, when at last Germany was unified instead of bearing the likeness of a modern civilized people, it presented itself to the world with the face of this archaic Bismarck, with a fierce moustache, huge jack boots, a spiked helmet, and a sword. In this war between Prussia and Austria, Prussia had for an ally Italy; most of the smaller German states, who dreaded the schemes of Prussia, fought on the side of Austria. The reader will naturally want to know why Napoleon III did not grasp this admirable occasion for statecraft and come into the war to his own advantage. All the rules of the Great Power game required that he should. But Napoleon, unhappily for himself, had got his fingers in a trap on the other side of the Atlantic, and was in no position to intervene. In order to understand the entanglement of this shifty gentleman, it is necessary to explain that the discord in interests between the northern and southern states of the American union, due to the economic differences based on slavery, had at last led to open civil war. The federal system established in 1789 had to fight the secessionist efforts of the confederated slave-holding states. We have traced the causes of that great struggle in Chapter XXXVI, sec 6; its course we cannot relate here, nor tell how President Lincoln (born 1809, died 1865, president from 1861) rose to greatness, how the republic was cleansed from the stain of slavery, and how the federal government of the union was preserved. The story of President Lincoln is in itself a great epic of union and order threatened and saved, and it is with reluctance that it is treated so briefly here. But in this Outline we must cling closely to our main story. For four long years (1861-65) this American civil war swung to and fro, through the rich woods and over the hills of Virginia between Washington and Richmond, until at last the secessionist left was thrust back and broken, and Sherman, the unionist general, swept across Georgia to the sea in the rear of the main confederate (secessionist) armies. All the elements of reaction in Europe rejoiced during the four years of republican dissension; the British aristocracy openly sided with the confederate states, and the British Government permitted several privateers, and particularly the Alabama, to be launched in England to attack the federal shipping. Napoleon III was even more rash in his assumption that after all the new world had fallen before the old. The sure shield of the Monroe Doctrine, it seemed to him, was thrust aside for good, the Great Powers might meddle again in America, and the blessings of an adventurous monarchy be restored there. A pretext for interference was found in certain liberties taken with the property of foreigners by the Mexican president. A joint expedition of French, British, and Spanish occupied Vera Cruz, but Napoleon’s projects were too bold for his allies, and they withdrew when it became clear that he contemplated nothing less than the establishment of a Mexican empire. This he did, after much stiff fighting, making the Archduke Maximilian of Austria Emperor of Mexico in 1864. The French forces, however, remained in effectual possession of the country, and a crowd of French speculators poured into Mexico to exploit its mines and resources. But in April, 1865, the civil war in the United States was brought to an end with the surrender of the great southern commander, General Lee, at Appomattox Court House, and the little group of eager Europeans in possession of Mexico found themselves faced by the victorious federal government in a thoroughly grim mood, with a large, dangerous-looking army in hand. The French imperialists were bluntly given the alternative of war with the United States or clearing out of America. In effect this was an instruction to go. 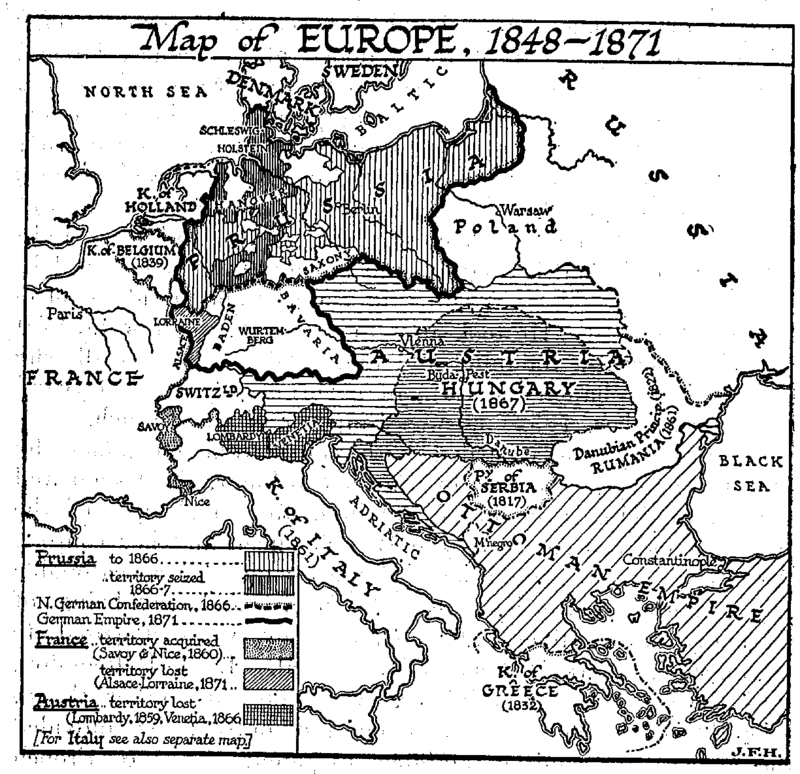 This was the entanglement which prevented Napoleon III from interference between Prussia and Austria in 1866, and this was the reason why Bismarck precipitated his struggle with Austria. While Prussia was fighting Austria, Napoleon III was trying to escape with dignity from the briars of Mexico. He invented a shabby quarrel upon financial grounds with Maximilian and withdrew the French troops. Then, by all the rules of kingship, Maximilian should have abdicated. But instead he made a fight for his empire; he was defeated by his recalcitrant subjects, caught, and shot as a public nuisance in 1867. So the peace of President Monroe was restored to the new world. There remained only one monarchy in America, the empire of Brazil, where a branch of the Portuguese royal family continued to reign until 1889. In that year the emperor was quietly packed off to Paris, and Brazil came into line with the rest of the continent. But while Napoleon was busy with his American adventure, Prussia and Italy were snatching victory over the Austrians (1866). Italy was badly beaten at Custozza and in the naval battle of Lissa, but the Austrian army was so crushed by the Prussian at the battle of Sadowa that Austria made an abject surrender. 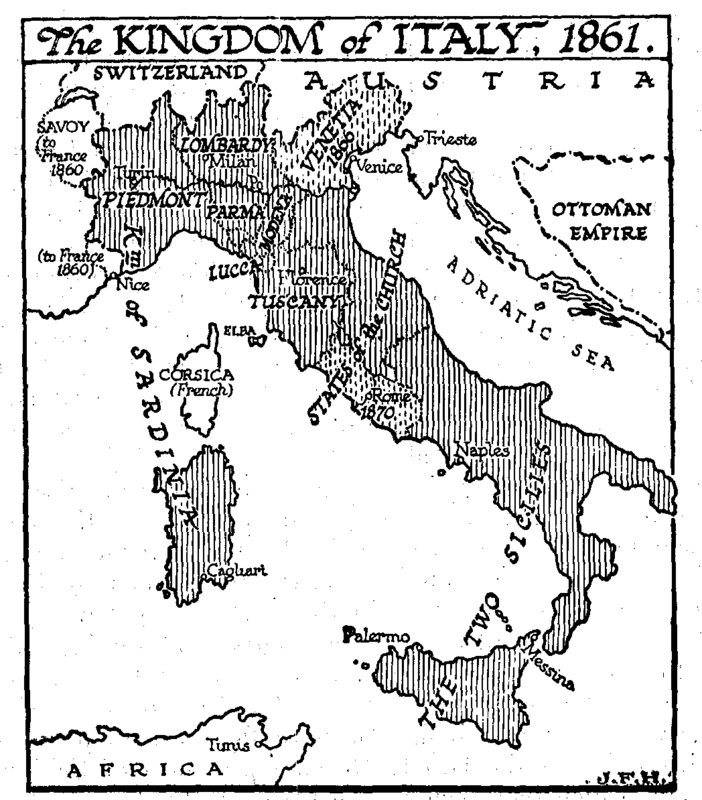 Italy gained the province of Venetia, so making one more stop towards unity—only Rome and Trieste and a few small towns on the north and north-western frontiers remained—and Prussia became the head of a North German Confederation, from which Bavaria, Wurttemberg, Baden, Hesse, and Austria were excluded. Four years later came the next step towards the natural political map of Europe, when Napoleon III plunged into war against Prussia. A kind of self-destroying foolishness urged him to do this. He came near to this war in 1867 so soon as he was free from Mexico, by demanding Luxembourg for France; he embarked upon it in 1870, when a cousin of the king of Prussia became a candidate for the vacant throne of Spain. Napoleon had some theory in his mind that Austria, Bavaria, Wurttemberg, and the other states outside the North German Confederation would side with him against Prussia. He probably thought this would happen because he wanted it to happen. But since 1848 the Germans, so far as foreign meddling was concerned, had been in spirit a united people; Bismarck was merely imposing the Hohenzollern monarchy, with pomp, ceremony, and bloodshed, upon accomplished facts. All Germany sided with Prussia. Early in August, 1870, the united German forces invaded France. After the battles of Worth and Gravelotte, one French army under Bazaine was forced into Metz and surrounded there, and, on September 1st, a second, with which was Napoleon, was defeated and obliged to capitulate at Sedan. Paris found herself bare to the invader. For a second time the promises of Napoleonisim had failed France disastrously. On September 4th, France declared herself a republic again, and thus regenerated, prepared to fight for existence against triumphant Prussianism. For though it was a united Germany that had overcome French imperialism, it had Prussia in the saddle. The army in Metz capitulated in October; Paris, after a siege and bombardment, surrendered in January, 1871. With pomp and ceremony, in the Hall of Mirrors at Versailles, amidst a great array of military uniforms, the King of Prussia was declared German Emperor, and Bismarck and the sword of the Hohenzollerns claimed the credit for that German unity which a common language and literature had long since assured. The natural map had already secured political recognition in the Austrian Empire after Sadowa (1866). Hungary, which had been subordinated to Austria, was erected into a kingdom on an equal footing with Austria, and the Empire of Austria had become the «dual monarchy» of Austria-Hungary. But in the south-east of this empire, and over the Turkish empire, the boundaries and subjugations of the conquest period still remained. «We don’t want to fight, but, by Jingo, if we do, We got the ships, we got the men, we got the munn-aye too»…. «The Russ’ns shall not ‘ave Con-stan-te-no-ple». In consequence of this British opposition, a conference was assembled in 1878 at Berlin to revise the treaty of San Stefano, chiefly in the interests of the Turkish and Austrian monarchies, the British acquired the island of Cyprus, to which they had no sort of right whatever, and which has never been of the slightest use to them, and Lord Beaconsfield returned triumphantly from the Berlin Conference, to the extreme exasperation of Mr. Gladstone, with what the British were given to understand at the time was «Peace with Honour». 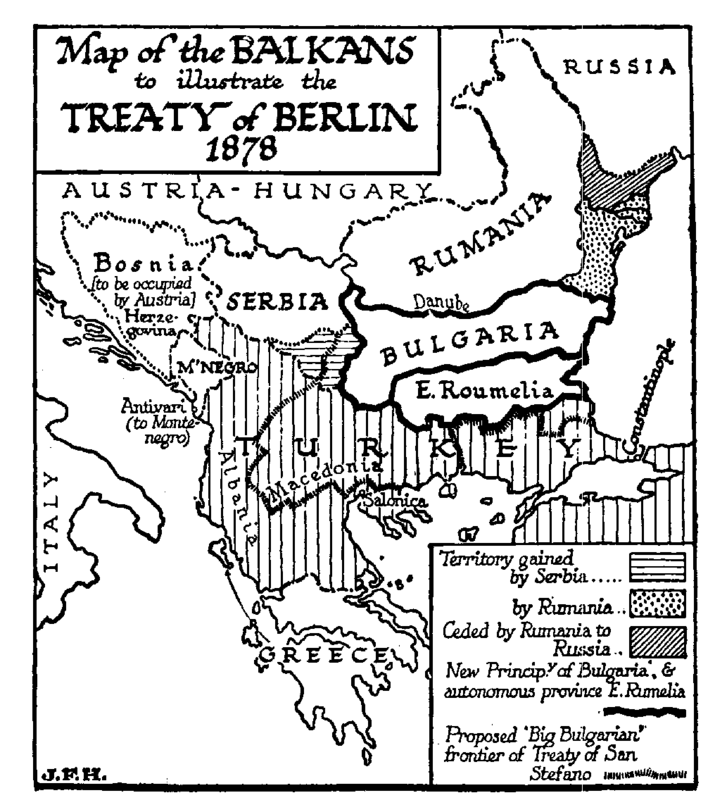 This treaty of Berlin was the second main factor, the peace of Frankfort being the first, in bringing about the great war of 1914-18. These thirty years after 1848 are years of very great interest to the student of international political methods. Released from their terror of a world-wide insurrection of the common people, the governments of Europe were doing their best to resume the game of Great Powers that had been so rudely interrupted by the American and French revolutions. But it looked much more like the old game than it was in reality. The mechanical revolution was making war a far more complete disturbance of the general life than it had ever been before, and the proceedings of the diplomatists were ruled, in spite of their efforts to disregard the fact, by imperatives that Charles V and Louis XIV had never known. Irritation with misgovernment was capable of far better organization and far more effective expression than it had ever been before. Statesmen dressed this up as the work of the spirit of Nationalism, but there were times and occasions when that costume wore very thin. The grand monarchs of the seventeenth and eighteenth centuries had seemed to be free to do this or that, to make war or to keep the peace, to conquer this province or cede that as they willed; but such a ruler as Napoleon III went from one proceeding to another with something of the effect of a man who feels his way among things unseen. None of these European governments in the nineteenth century was in fact a free agent. We look to-day at the maps of Europe since 1814, we compare them with the natural map, and we see that the game the Great Powers played was indeed a game of foregone conclusions. Whatever arrangements they made that were in accordance with the natural political map of the world, and the trend towards educational democracy, held, and whatever arrangements they made contrary to these things, collapsed. We are forced, therefore, to the conclusion that all the diplomatic fussing, posturing, and scheming, all the intrigue and bloodshed of these years, all the monstrous turmoil and waste of kings and armies, all the wonderful attitudes, deeds, and schemes of the Cavours, Bismarcks, Disraelis, Bonapartes, and the like «great men», might very well have been avoided altogether had Europe but had the sense to instruct a small body of ordinarily honest ethnologists, geographers, and sociologists to draw out its proper boundaries and prescribe suitable forms of government in a reasonable manner. The romantic phase in history had come to an end. A new age was beginning with new and greater imperatives, and these nineteenth-century statesmen were but pretending to control events. Hence “Jingo” for any rabid patriot.